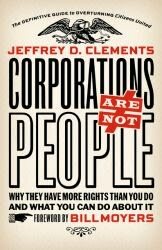 Corporations Are Not People: Why They Have More Rights Than You Do and What You Can Do About It is a new, practical guide to dismantling corporate rule and building a working-for-the-people democracy. Jeffrey Clements, of Free Speech for People, presents the history of how some of the largest corporations in the world pushed a decades-long campaign to take over American politics and policy, most recently through the Citizens United decision. The website's here, with links to order the book (ideally from your local bookstore), info and reviews. This one is worth buying for you and for your local library! Jeff will be a guest on the Portland AfD show Populist Dialogues in February. Check back for a link to the show, which can be rebroadcast on your own local community access station.